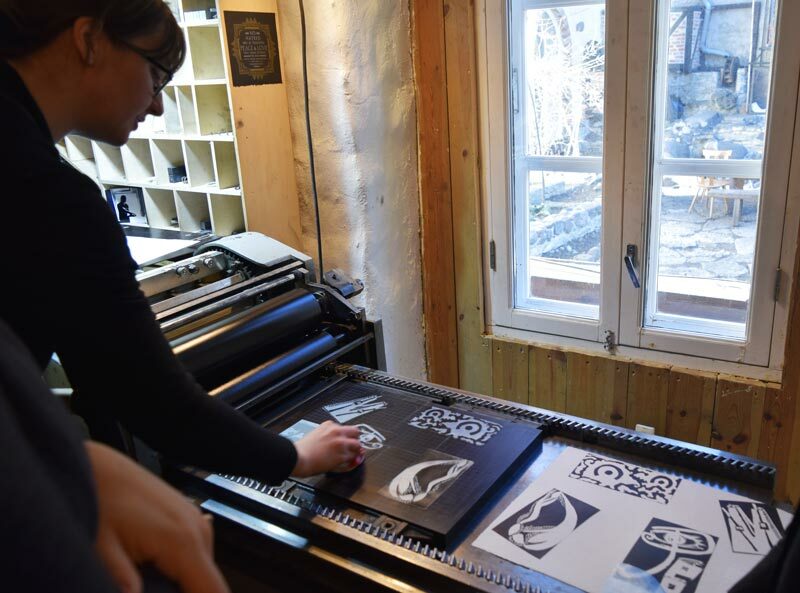 Labora recently hosted the third Creative Makers partner meeting in Tallinn’s historic Old Town. As none of our guests had visited Tallinn nor Estonia before, we also introduced them to various Estonian customs and showed them several of Old Town’s hidden gems during the course of the workshop. The first signs of Estonian spring had made us quite enthusiastic. Our friends from Spain, of course, did not agree with us as they considered the weather to be far too wintery. 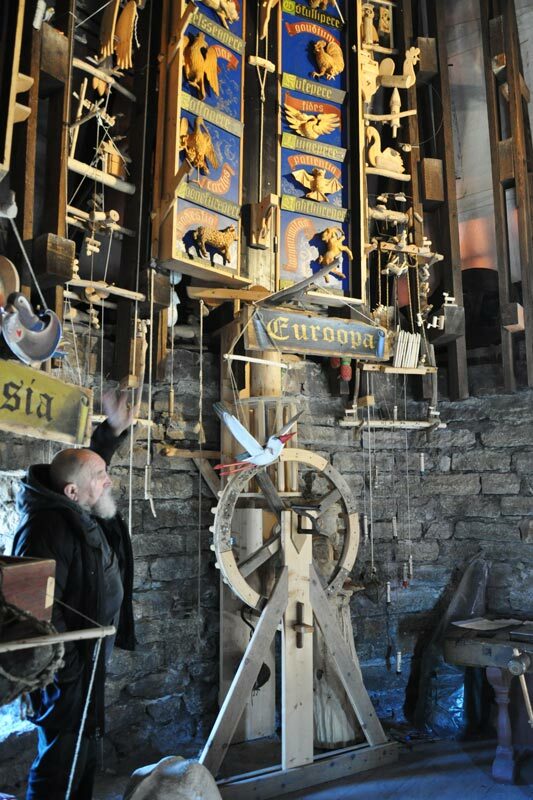 We took our guests to the Wooden Horse Museum in our Old Town Tower. From there, we showed them one of the most exclusive and beautiful views of our city while we also examined masterful works of wooden handicraft. Anatoli, Labora’s senior and most experienced member, showed everyone some of the wooden toys he had created. He spoke to all of us about how he uses these toys to tell stories to children. He reminded us that children interact and learn through games and through their toys. And he also proved that where there is great will and inventiveness, language barriers are no longer an obstacle for effective communication between people. At our Creative Makers meeting, we gave our guests the chance to take part in our most popular workshops. We started from the very beginning. In order to talk about the art of printing, your must first think about what you are going to print on – in this case paper. And so we introduced to them to the traditional methods of hand paper making which we still practice. During this workshop, everyone got a chance to make their own paper which proved to be a real hit. Afterwards, everyone could take their handmade paper home with them, to print important works or to write love letters. As celebrating Easter was still on our minds and spring was in the air, we showed our friends how to make seed bombs. Seed bombs are cute colored balls that are easy to make from paper pulp and, as their name suggests, are then filled with seeds. In making them, we combined something useful with something fun. Our guests became very creative as they worked on them. At first, we started rolling the seed bombs into our usual balls, but then our guests quickly started experimenting by making them into other shapes and sizes. Some even made little sculptures out of the seed-filled paper pulp. Now that our partners have returned to their homes, they can plant their seed sculptures on their window sills or in a neighbour’s garden, so that flowers and plants can grow freely everywhere. After a long day of workshops, we then visited a talkshop where the artistic duo Varvara & Mar welcomed us into their studio. The two spoke about modern technologies and how to combine traditional crafts with contemporary machines. We were particularly impressed by the crochet machine they had created and their point of view as artists. On the second day, our experienced printer Hannah introduced our various printing machines to our partners. Everyone got to give them a try. Hannah then led a workshop where we designed postcards. Some took advantage of designing their own cards to write letters to loved ones back at home or even to send messages to themselves. During this second workshop, Hannah gave us a very liberating and yet very restrictive task. She placed hundreds of letters on the table and said that we could only use them – and yet not use them to write any words. We had to create stories and print pictures using letters but not words. This turned out to be a very entertaining and educational experience – and perhaps even the most popular event of our workshop. The following day, everyone discussed how to use this exercise in the larger CREAM project as well as how to tailor it for their own venue. Some guests were so inspired by the workshop that they couldn’t stop creating cards and posters – we had to hide the ink so we could get to the next workshop! Nestor, Labora’s creative director, taught the guests how to print with photopolymer next. In this workshop, everyone was able to develop their design thinking, because everything had to be created in mirror image. On the last day, we introduced our guests to our version of potato printing. The tradition of potato printing is very much loved here in Estonia where we even used to have a Potato Festival! Potato printing is a reusable and playful way of introducing children to the world of printing. And while all of our guests had printed with potatoes before, they had never done it the way we had planned for them. 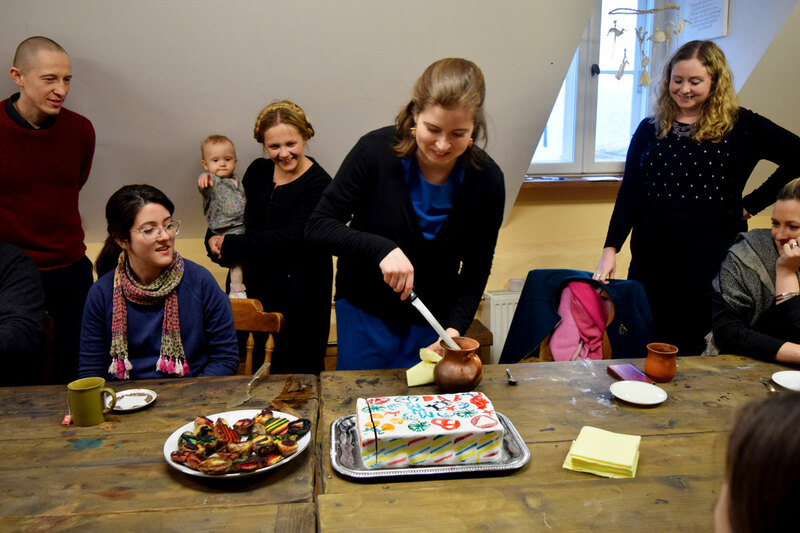 To start things off, our project manager Veronika baked a cake and then we surprised our friends by using food colors instead of the usual ink for our potato printing workshop. The cherry on top of the cake – pun intended – was that after making their prints, we let everybody decorate the cake with their own potato stamps. And to finish things off, we cooked up our potato stamps and then enjoyed an artistic and delicious banquet! Our next meeting will be in June and will be hosted by our partners from Vilanova. During this meeting they will share their expertise with us, however we will also focus on developing workshops for children. 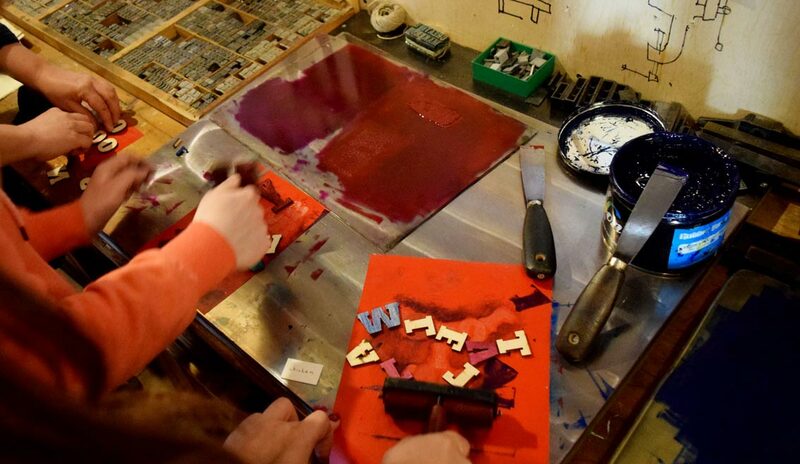 These workshops will aim to combine traditional letterpress printing with modern technology, which will encourage children to explore typography and printing in a creative and innovative way! The test workshops are planned for the summer months – make sure you don’t miss them! Leave us your e-mail to receive news here.